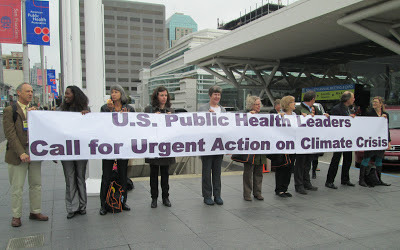 Earlier today, Annual Meeting attendees joined a Union of Concerned Scientists rally to demand federal action on climate change to protect people's health. Click here to join fellow health professionals in calling on policymakers to support the U.S. Environmental Protection Agency's authority to regulate the emissions that cause climate change. Will there be a doctor in the house? APHA officially launches Flu Near You! It's a public health circus! Literally! Speak up for public health! Lights, camera, (public health) action!